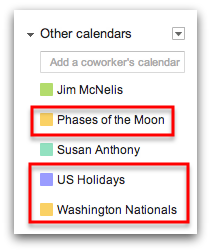 We all know the importance of adding a co-worker's calendar to your other calendar list in Google Calendar. Once added/subscribed, this gives you the ability to quickly see if the person or persons are available for the meeting that you are about to schedule without sending them an email asking for the availability. The question is, do you know how important it is to add your favorite sports teams calendars to your Google Calendar? :) Having the ability to add a viewable calendar of your favorite sports teams is just one of the awesome perks available in Google Calendar. You can also subscribe to your native countries holiday calendar, the phases of the moon calendar, even the sunrise and sunset times for your current location (if your location is noted in your Calendar Settings) just to name a few. First, you're going to have to open your calendar. After you have opened your calendar, locate the drop down arrow next to 'Other Calendars' and click on 'Browse Interesting Calendars' from the options that appear. The next screen that you will see is the 'Holidays' screen with tabs above the listed countries (Holidays, Sports, More). At this point, you can simply click on 'Subscribe' to the right of the country that you want to subscribe to so you can track the holidays listed on the calendar. *After clicking on 'Subscribe,' the calendar will appear in your 'Other Calendar' list. You can always unsubscribe to the calendars by following the steps above and clicking on 'Unsubscribe.' This will remove the calendar from the 'Other Calendar' list. This can also be done from your calendar settings. Baseball season is right around the corner and if you're a fan, you're going to want to be informed of each game that is happening on a regular basis. For today's example, I want to follow my favorite baseball team ... the Washington Nationals (Go Nats!). To do so, click on Sports --> Baseball --> Major League Baseball (MLB) --> locate your team and select 'Subscribe.' When finished, you'll notice in the image below the ability to go 'Back to Calendar,' click on this to return to your calendar to see the calendars you have added. The last tab, 'More,' is a very important tab to check out as well. Here, you can access the 'resources' available to you within your organization. These will only be available to you if the administrator of your domain has created these calendars and shared them accordingly. If that is the case, you can click on 'Resources for yourdomain.com' to view and subscribe to the appropriate resource calendars available to you (example - conference rooms, company cars, projectors). Under the 'More' tab you will also find the calendars for Phases of the moon, star dates, and sunrises/sunsets and others. As you can see, I subscribed to the US Holidays calendar, the Washington Nationals calendar, and the Phases of the Moon calendar. Each one of these calendars are listed under my 'Other Calendars' list in my Google Calendar. If you feel that your calendar view is to 'busy,' simply click on the calendars name to temporarily hide it. For a more interactive view of the steps taken to acces these calendars, watch the demonstrative video below! Please let us know if you have any questions or comments about this blog post in the comments section below. Also, if you found this post fun and informative, give it a +1 so others can benefit from it as well.